When Dr. Pawlovich was in grade seven, he went to a chiropractor to get help for an injury sustained while pitching baseball. He saw firsthand the great results from the treatments and watched the chiropractors enjoying the performance of their naturally healing craft. Chiropractic was attractive to him because he saw the active part it played in the health of athletes. This was and remains very important to Dr. Pawlovich. He knew instantly he wanted to be a chiropractor and did not sway from that path. 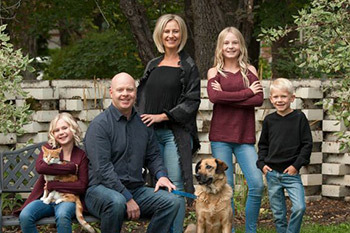 Dr. Pawlovich received his Doctor of Chiropractic and Bachelor of Science from Northwestern College of Chiropractic in Bloomington, Minnesota. He learned many chiropractic techniques including the Gonstead System. Dr. Pawlovich experienced great results in his own care with this technique and uses it today. 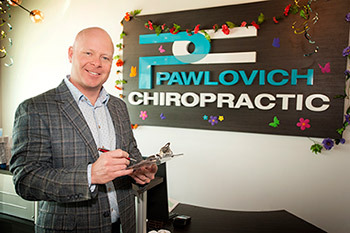 Later in his career, Dr. Pawlovich became trained in Torque Release Technique in order to provide an option for people that preferred not to have manual chiropractic care. He uses a type of instrument to help adjust his patients with this approach which is considered by many to be very gentle and effective. Dr. Pawlovich loves helping people improve their health and attain their goals. He feels that health is of the utmost importance. At Pawlovich Chiropractic, we seek optimal health naturally with a plan geared to your needs. Dr. Pawlovich was born and raised in Saskatoon. He spends his weekends and free time with his wife and three children. They mean the world to him. He has a keen interest in sports having played football and performed track with the University of Saskatchewan Huskies. He enjoys recreational hockey and baseball and hits the gym regularly. Helping other athletes is a joy for him. Dr. Pawlovich also volunteers on his church board and is a committee chair. He loves to cook and eat the products! He believes in healthy, clean eating. Dr. Pawlovich’s compassionate care is intended to put you at ease in order to begin the healing process. Call us today to schedule a visit at Pawlovich Chiropractic.